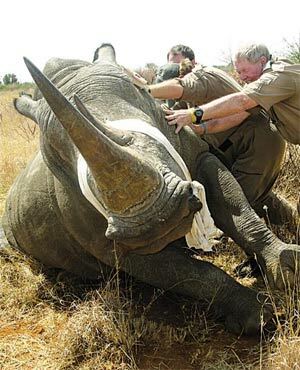 Cape Town - Private rhino owners have lost R1.45bn fighting poaching since 2009, Parliament's portfolio committee on environmental affairs heard on Tuesday. Around 330 private rhino reserves had lost rhino worth R300m to poaching, and spent a total of R1.15bn on security in the past seven years, Private Rhino Owners Association representative Angus-Sholto Douglas told MPs. Of the 6 000 rhino poached in that period, 1 200 had been on privately-owned land. “It's one of the worst environmental crimes you can experience as an owner,” he said. Douglas said there was now a negative perception around rhino ownership, and many owners were selling their animals to parks in Namibia. Some were donating theirs to Botswana. He suggested that Parliament should look at setting minimum requirements for receiving a permit when purchasing rhino. He used an example from 2001, when he was required to have a certain number of guards per 1 000ha in order to purchase rhino from Botswana. Private owners and conservationists currently own approximately 28% of the country’s white rhino population, and 9% of the black rhino population. ← What can we expect from SA at CoP 17?